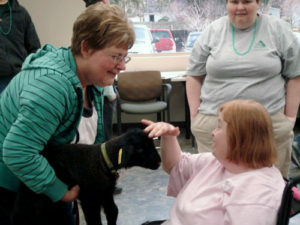 The Greene County Board of Developmental Disabilities provides services and support for clients with differing abilities in the Greene Country Community. 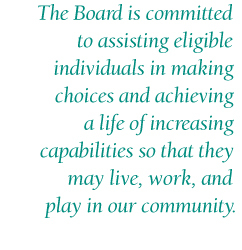 Providing services from early childhood, through adulthood and elderly life stages, the Board is committed to assisting eligible individuals in making choices and achieving a life of increasing capabilities so that they may live, work, and play in our community. Our organization was previously known as the Greene County Board of Mental Retardation and Developmental Disabilities (MRDD). However, due to a state-mandated name change, we have removed the "mental retardation" from the name, although we continue to provide superior services and support for citizens with differing disabilities.